I went along to Caulfield expecting to have two bets. Protectionist in Race 6 and Pride of Dubai in Race 8, the Blue Diamond. I couldn’t find the Cup winner in his stall early on but he eventually turned up to be saddled and was the first horse out in the parade ring. But he was very unsettled, tossing his head around and changing stride. A little bit of sweat forming in the flank, not that sweating is a problem on a hot and humid day. But the horse looked nothing like the perfect, relaxed horse I saw last November. 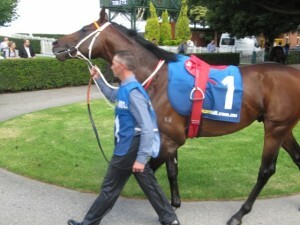 In contrast, Happy Trails was happy, as well as dry and paying attention to the strapper, with an occasional tail flick. I backed the happy horse. In fact, I ended up having more than two bets. Pride of Dubai did the right thing, and I landed two other placed horses, Choose and Minnesinger. In fact, that made it four out of four. My best for quite some time! The cacophony of sound from the Soundwave concert at the Showgrounds was simply appalling. A wall of noise. It blasted straight into the birdcage stalls and parade ring. The horses and humans hated it. It’s a sign of old age when you start muttering “they call that music?”. There will be a lot of deaf pensioners in 50 years time! The lightning arrived on cue and the race was delayed some ten minutes by electrical activity. All the tote screens in the Members blew out! 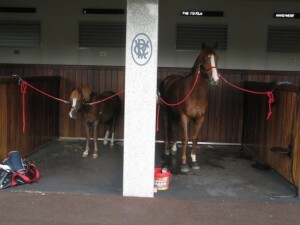 Fab Fevola looked great in his stall with his clone, Litte Fab, but was obviously outclassed in the race. The bubble burst on the next big thing, Deep Field, who was dispensing liberal doses of sloppy excrement in the yard. The world’s best sprinter Lankan Rupee looked very cool, but I liked Brazen Beau who grabbed second at $2.20. I was cashed up and sitting on two out of two coming to the last, but blew it on Berrimilla. Still, Swift Shadow at $3.90 meant I had a pretty good day. I haven’t seen a walleyed horse in yonks. But here’s Blue Eyes, a four-year-old maiden mare. 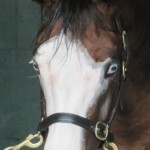 The iris of walleyed horses lacks the normal pigment and is either white or pale blue in colour. This lack of pigment doesn’t affect the vision of the horse. 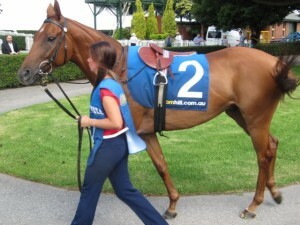 Blue Eyes ran an even race to finish sixth. 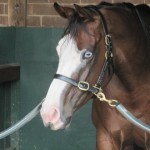 The horse is trained by Pat Carey, owned by Trevor Delroy, and bred on his magnificent property Wyadup Valley Farm, near Canal Rocks, in Western Australia. The sire is that cantankerous stallion Helenus. There was 22 mm of rain in my gauge at home so the prospects were not looking too good for a bet, especially since the Caulfield track has been closed since the spring and the surface relaid. I arrived to find the track rated as a Soft 5. What the hell is a Soft 5?! Greg Miles kept on calling it a Slow 5. But everyone was surprised when they ran a track record in the first and it was immediately upgraded to Good 4, and by the middle of the day a Good 3. What has happened to Dead? Gone the way of the dodo? Three bets for a faultless winner, my old favourite, Smokin’ Joey, and two losers, Heatherly and Griante. Both my losers looked like winners at the 300, and I was counting my money, but they both faded dramatically to miss a place. I forgot that there is time enough for counting when the racing is done. A rare losing day. 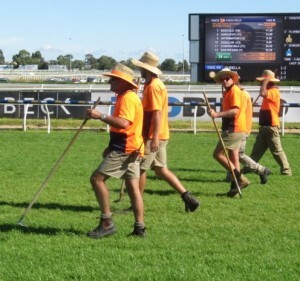 I took a pic of the stampers, those blokes that stamp down the divots. In the new book I mentioned that they use a wooden block without ever really checking. And here they are with miniature rakes! Looks like a last minute edit. Nearly set to go to the printer.